Carcassonne: Hunters and Gatherers , Klaus-Jürgen Wrede, Hans im Glück/ Rio Grande Games, 2002. Game discussion by Dan Becker, 2002/11/26. 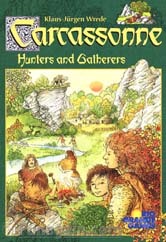 Carcassonne: Hunters and Gathers is another in the series of Carcassonne games from Klaus-Jürgen Wrede. This game introduces new scoring symbols, special tiles, scoring markers and a new artist. This is not a game review as I have not yet played Carcassonne: Hunters and Gatherers enough to make a review. However, the times I have played it I have enjoyed it enough to want to play more. Gold nugget - triggers special tile placement. Fish - affects meeple and fish hut scoring. Deer, mammoth, aurochs, and tiger - affects field scoring. Mushrooms - affects forest scoring. Stonehenge, forest fires - affects forest scoring. Each region may have one or more of these decorators. Click on the images to view variations of the tiles. The following text will help you read the chart. Each row has a loose theme. The first two rows contain no rivers. The last row contains no forests. The third row contains one river edge. The fourth and fifth rows contain two river edges. As you move from left to right, in general there are more forest edges. Another difficulty is distinguishing the special tiles which may or may not come into play. The special tiles are distinguished via the "+" (plus sign). So the first square shows "3+1" which means that there are 3 regular tiles and 1 special tile of this type. The special tiles also have a tiny gold nugget symbol superimposed at the bottom of the tile. The start tile is a special case. It has the "+1" designator, but no special symbol. It is the default tile shown in row 3 column 3. Although some of the square appear to be variations, they actually contain quite different tiles. For instance, the last image (sixth row, sixth column) contains tiles with 4 river edges. One tile has a fully connected central lake. The other tiles have curving rivers and no central lake. Although they will fit in the same square, these tiles will play completely differently. Similarly, the first and second rows, each column has the same edge features, but a different play result. For instance, the first row, first column will continue a meadow, but the second row, first column will play in the same area, but will divide a meadow. Finally, if there are errors or you have come up with a nice compact, well-organized chart, please let me know. As always, I welcome any feedback on this page or the site. Lost Tiles of Carcassonne article. Easy-to-print Carcassonne Expansion tile distribution. Easy-to-print Carcassonne:Hunter and Gatherers tile distribution. Last modified: Thursday, 09-Jun-2011 12:36:41 MST.